In this post I’ll discuss Search Result Types and Display Templates. 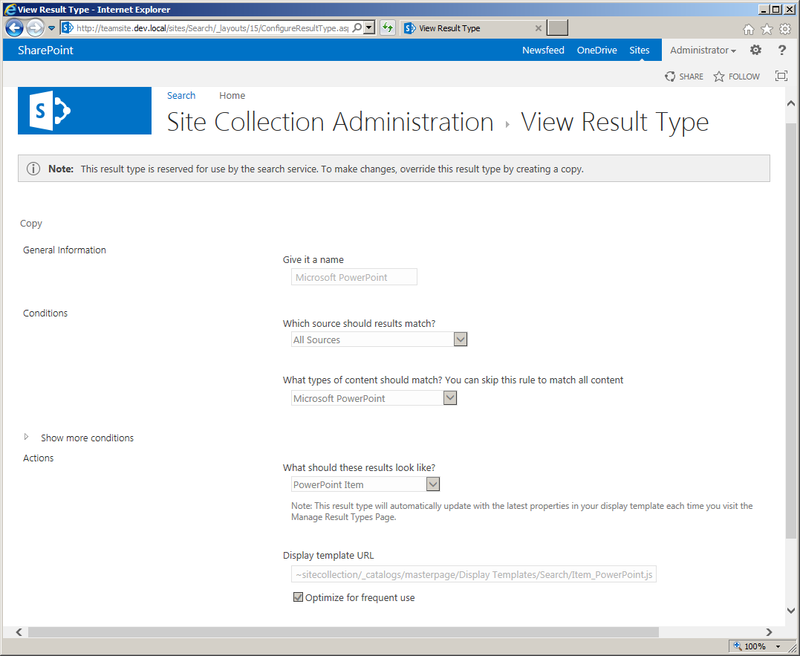 Both are new features coming with the new Search platform in SharePoint 2013. You’ll need them in case you want to customize the way how search results are displayed. In the past XSLT was the way to go by changing the search results page and change the Web Part settings XSLT. In 2013 this functionality is no longer available and Results Types and Display Templates are the way to go. For each Result Type you can specify the name and conditions. The conditions filter first on Result Sources. You can also select the option to use all if you don’t want to filter on it. Next you can filter on the type of results. This is a predefined set of types which SharePoint recognizes. When you expand “Show more conditions” you have the ability to create filters based on Managed Property values. In case you have added additional fields to specific content types and you want to filter on them you can use this functionality to add a filter. The last option you need to select a Display Template. This list is created based on the approved Display Templates in the Master Page Gallery (in the subfolder Display Templates). This is actually the template that is used to render the Search Result which is matching this Result Type. When created it will appear in the top section of available Result Types. 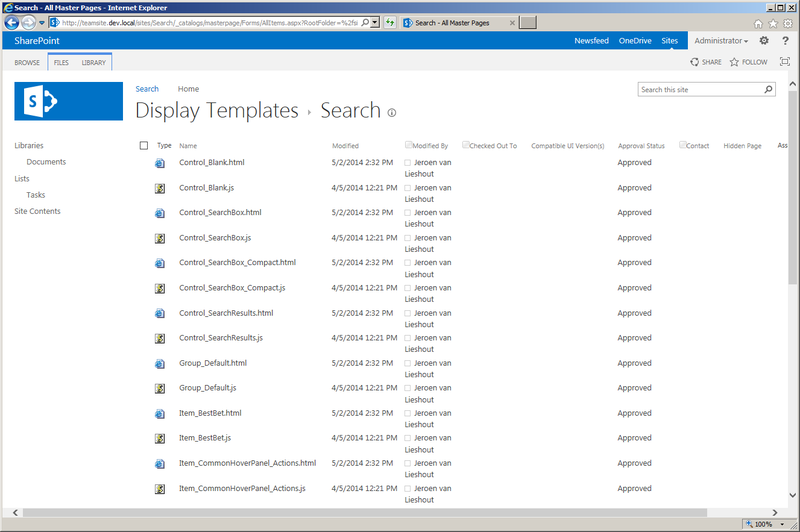 List of Search Display Templates in the Master Page Gallery. 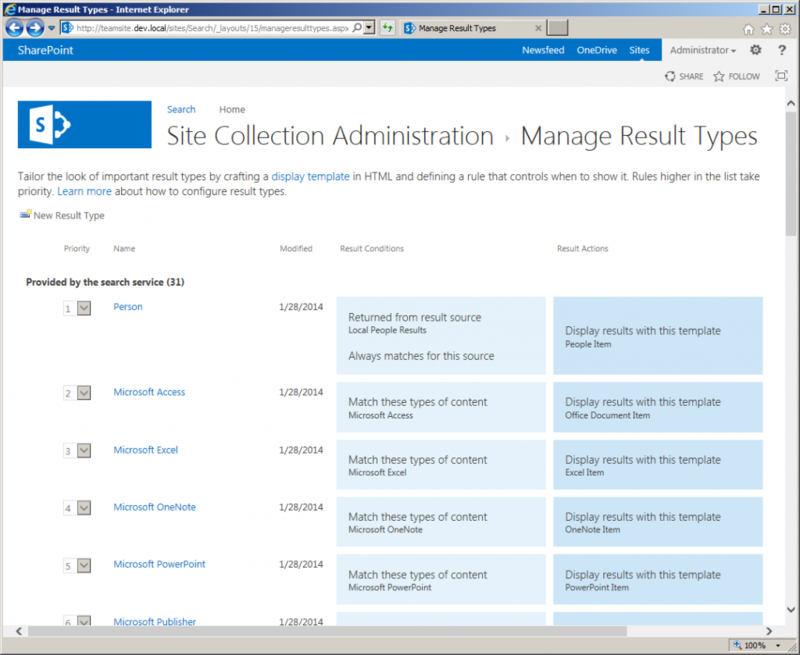 This entry was posted in SharePoint and tagged Display Templates, Result Types, Search on 30 June 2014 by captain007. Here’s how to automatically expand the “Show More” links under each refiner. Issue: On our search pages, the refiners return 5 items and a . Clicking expands the list to show all. We would like to increase the initial number of items returned. Details: When editing these files, “//” on a line comments out anything following. I created & edited the new file Filter_Default_expanded.html from \\sp.mycompany.com\_catalogs\masterpage\Display Templates\Filters\Filter_Default.html. The first section of code “var shortListSize”, sets the threshold for the initial number of rows returned. By default it is set to 5. Change this number to anything you like. The second section of code “shortListSize” sets the threshold at which all rows are returned. By default it is set to 6. Change this number to anything you like. Change the on the third line of the file. This is the name that will appear in the “Display template” dropdown as shown below. Once the above changes are saved and assuming you saved them into a new filter, you need to select the new filter in your refiner setup. Hii,you have posted great information.